Chart of the Day: Will hospitality REITs recover in the next 2 years? 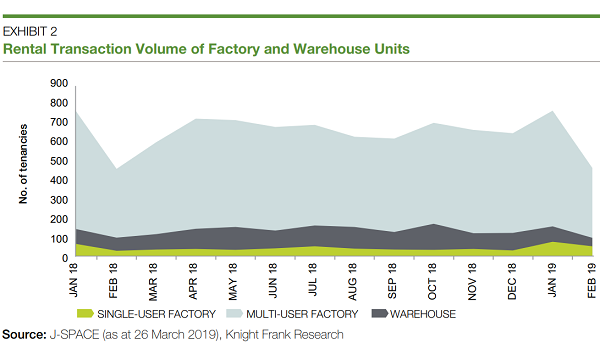 Distribution per unit is expected to grow 4%. 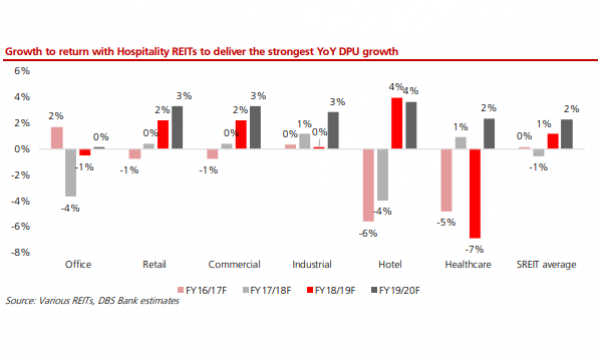 This chart from DBS Equity Research forecasts Singapore's hospitality REITs to register the strongest growth of distribution per unit (DPU) amongst S-REITs for the next two years. The overall DPU of hospitality REITs is expected to grow 4% per year in 2018 to 2020. DBS Equity Research cited the strong growth profile of CDL Hospitality Trusts, due to its acquisitions in the previous year and the expected recovery in the Singapore hospitality market. Singapore's hospitality market has suffered from low profits and revenue per available room (RevPAR) brought about by hotels' weak performance, supply pressures, and low demand. In the third quarter of 2017, it was considered the worst performer amongst S-REITs. Retail REITs and industrial REITs are also expected to deliver strong growth in the next two years at 2-3% per year. They could be boosted by Frasers Centrepoint Trust (retail) after it revamps the Northpoint Wing and Keppel Data Centre REIT (data centre, industrial) due to the acquisition of data centres. DPU of healthcare REITs, on the other hand, is expected to fall by as much as 7% in 2018-2019, but jump back up by 2% in 2019-2020. Overall, S-REITs are expected to deliver an average DPU growth of 1% in 2018-2019 and 2% in 2019-2020.